AllegroMedical.com presents The Thick-It® AquaCareH2O® 8 oz. 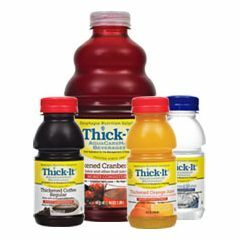 Thick-It® AquaCareH2O® Beverages are the next generation of pre-thickened beverages for individuals with difficulty swallowing. These delicious thickened beverages are made from pure Artesian mineral water. This pristine water comes from a well 600 feet below the ground which is then thickened with xanthan gum using a patented process resulting in thickened water that looks and tastes natural. Made with pure Artesian mineral water, they are available in orange juice, apple juice and cranberry juice. This pure appearance and natural taste may improve patient intake and hydration status. Add powdered drink mixes for variety: tea, coffee, cocoa, broth, lemonade, milk, laxative or nutritional drink powder.